Fall’s most famous drink is—spoiler alert—often loaded with sugar and doesn’t have a whole lot of actual pumpkin. Make these healthy tweaks to your next order for a better, more balanced sip. If there’s one thing that’s synonymous with fall, it’s the pumpkin spice latte. 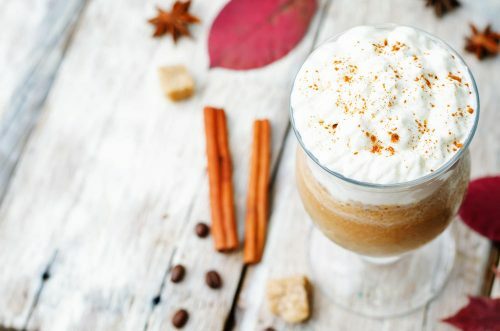 We understand why: the drink is delicious, and with hits of cinnamon and a dollop of whipped cream on top, it feels comforting to hold a warm glass between your hands and enjoy it sip by sip. And while pumpkin, in its natural state, is actually a super-healthy food packed with vitamins, minerals, and fiber, the sugar-filled PSL doesn’t have a whole lot of it. Which is why the infamous drink can quickly derail your diet—and wreak havoc on your blood sugar and digestive system—if it becomes a go-to order. So next time you place an order for a delicious PSL, keep these healthy hacks in mind. They’ll make the drink a little less indulgent without sacrificing any of the decadent flavor. This is an easy one, but a tip worth repeating: Go for the smallest size at your coffee shop to easily eliminate a crazy amount of calories. If Starbucks is your top choice, opting for a Tall over a Grande (without any other healthy changes) can save you 80 calories, while a Short (the eight-ounce cup you probably forgot existed) saves 170 calories. Ask for one pump of the pumpkin spice syrup over the standard three in a Tall drink. (Grandes get four and Ventis get five!) That way you’ll still taste a waft of the flavoring you’re looking for without overdoing it. Want more natural flavor? Sprinkle cinnamon on top, then swirl into your drink. Starbucks uses 2% milk as their default, but other coffee shops may use whole—once you know what you want, be sure to specify so it’s crystal clear. Switching to skim can save calories, but remember that the absence of fat means the sugar may hit your bloodstream quicker. You can also opt for nut milks, like almond and coconut, but sweetned varieties—think vanilla almond milk over regular—is used most often, and that contains extra sugar. It uses less milk than a latte, so it’s an easy swap that salves calories without drastically changing the taste. Want even more of a change? Order a black coffee with one pump of pumpkin spice syrup, then add your own milk and cinnamon. Cutting that from your standard drink immediately slashes 70 calories, so save it for when you’re really in the mood to splurge. It’s actually pretty easy to DIY. Try this recipe from Greatist or, on days you’re feeling indulgent, this recipe from The Kitchn. Want more pumpkin in your life? Try these creative pumpkin recipes, these pumpkin recipes from around the world, and these pumpkin breakfast cookies (they taste just like dessert).